Elizabeth Hemminger passed away peacefully at East Gate Lodge in Beausejour on Sunday, August 19, 2018 at the age of 92. She now joins her loving husband and dance partner, Louie who predeceased her in 1997, as well as her sisters Lena Kowalke, Adella Patzer, Hilda Zirk, Eleanor Gatzke and Irene Frank. Mom will be lovingly remembered by her sons: Glen (Pauline) and their children: Charlotte (Andie Loffelbein), Corrie (Bob Anderson) and children Zeeva and Rowan; Jim (Barb) and their children: Robert (Pamela) and children Jesseca and Kieran; Michael (Kari) and their son Dylan; Donald (Patricia) and their children: Vanessa (Christopher Kasprowicz) and their son Jayson, Aaron (Melissa Turnbull); Sid (Cathy) and their children: Lindsay Candiotti (Piero) and their children Luka and Mikayla; and Alyssa Froese (Travis). As well, she is survived by her brother Edward Neurenberg as well as numerous nieces and nephews. Mom will always be remembered for her selfless, caring nature and especially her tireless strength in caring for dad throughout his illness. Our family would like to extend our sincere gratitude to the staff of East Gate Lodge. Your respect, kindness, and care given to our Mom will never be forgotten. Funeral Service will be held at 11:00 a.m. on Friday, August 24 at Zion Lutheran Church, 403 First Street N., Beausejour with viewing one hour prior to the service with interment following in the church cemetery. our deepest condolences to all the family, may she rest in peaceful sleep. Our sincere condolences to all of you in the loss of your mother. May God who understands each need, who listens to every prayer, bless you and keep you in His tender loving care. May your memories give you peace and comfort. 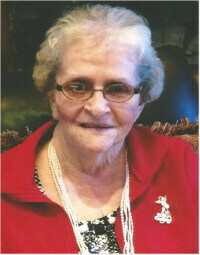 The Hemminger family So sorry to hear of your mother passing, she was a wonderful lady with a great heart . Remember when you feel a gentle breeze that will be your Mom close by waving her wings. Treasure the memories.